Knowledge about dinosaurs comes from both fossil and non-fossil records, including fossilized bones, feces, trackways, gastroliths, feathers, impressions of skin, internal organs and soft tissues. Dinosaur remains have been found on every continent on Earth, including Antarctica. This shows that all land masses were at one time connected in a super continent, called Pangaea, due to the fact that numerous fossils of the same species have been found on completely different continents. Pangaea began to break up during the Triassic period around 230 Mya. 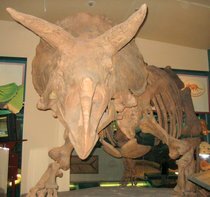 Since the first dinosaur was recognized in the 19th century, their mounted, fossilized skeletons have become major attractions at museums around the world. Dinosaurs have become a part of world culture and remain consistently popular, especially among children. 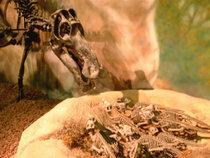 They have been featured in best-selling books and blockbuster films such as Jurassic Park, and new discoveries are regularly covered by the media. The term is also used informally to describe any prehistoric reptile, such as the pelycosaur Dimetrodon, the winged pterosaurs, and the aquatic ichthyosaurs, plesiosaurs, and mosasaurs, though none of these are dinosaurs. The on-going dinosaur renaissance began in the 1970s and was triggered, in part, by John Ostrom's discovery of Deinonychus, an active, vicious predator that may have been warm-blooded (homoeothermic), in marked contrast to the prevailing image of dinosaurs as sluggish and cold-blooded. 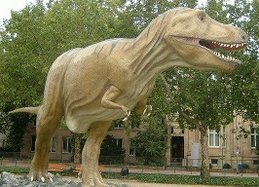 Vertebrate paleontology has also become a global science, with major new discoveries in previously unexploited regions, including South America, Madagascar, Antarctica, and most significantly the amazingly well-preserved feathered dinosaurs in China, which have further solidified the link between dinosaurs and their living descendants, modern birds. The widespread application of cladistics, which rigorously analyzes the relationships between biological organisms, has also proved tremendously useful in classifying dinosaurs, which are still known from an incomplete fossil record. The superorder or clade "Dinosauria" was formally named by the English scientist Richard Owen in 1842. The term is a combination of the Greek words deinos ("terrible" or "fearfully great" or "formidable") and sauros ("lizard" or "reptile"). The name was chosen to express Owen's awe at the size and majesty of the extinct animals, not out of fear or trepidation at their size and formidable arsenal. Dinosaurs are extremely varied. Some were herbivorous, others carnivorous. Some dinosaurs were bipedal, others quadrupedal, while others could walk easily on both two and four legs, such as the dinosaur Ammosaurus. However, birds are morphologically distinct from their reptilian ancestors, and referring to birds as "avian dinosaurs" and to all other dinosaurs as "non-avian dinosaurs" is clumsy. Birds are still birds, at least in popular usage and among ornithologists. It is also technically correct under the older Linnaean classification system, which accepts taxa that exclude some descendants of a single common ancestor (paraphyletic taxa). Paleontologists mostly use cladistics in their classifications, which classifies birds as dinosaurs, but many other scientists do not. As a result, this article will use "dinosaur" as a synonym for "non-avian dinosaur", and "bird" as a synonym for "avian dinosaur". Only a tiny percentage of animals ever fossilize, and most of these remain buried in the earth. As a result, the smallest and largest dinosaurs will probably never be discovered. Even among those specimens that are recovered, few are known from complete skeletons, and impressions of skin and soft tissue are rare. Reconstructing a skeleton by comparing the size and morphology of bones to those of similar, better-known species is inexact, and restoring the muscles and other organs is, at best, educated guesswork. While the largest and smallest dinosaurs will probably remain unknown, and a comparison between existing specimens is imprecise, it is clear that, as a group, dinosaurs were large. By dinosaur standards the sauropods were gigantic. The smallest sauropods were larger than anything else in their habitat, and the largest were an order of magnitude more massive than anything else that has ever walked the Earth. The tallest and heaviest dinosaur known from a complete skeleton is the Brachiosaurus, which was discovered in Tanzania between 1907â€“12. It is now mounted in the Humboldt Museum of Berlin and is 12 m (38 ft) tall and probably weighed between 30,000â€“60,000 kg (30â€“70 short tons). 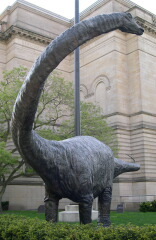 The longest dinosaur is the 27 m (89 ft) long Diplodocus, which was discovered in Wyoming and mounted in Pittsburgh's Carnegie Natural History Museum in 1907. Prices current as of last update, 04/23/19 5:21am.